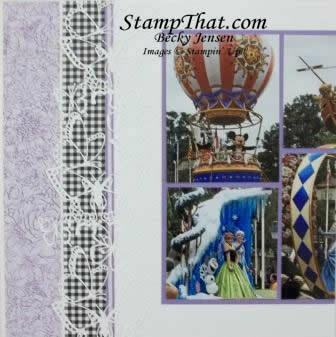 I wanted to use some of our free SAB Botanical Butterfly DSP on a scrapbook layout this month. I don’t really have pictures of butterflies, but I decided they would work for parade pictures. I wish the pictures were better. It’s really hard to see the detail of this! Maybe you can see it a little more here. Can you see the butterflies? They overlap onto the white and look so nice there. Members of the Scrapbooking Club will make this layout this month. It is great for anything involving flowers, butterflies, a special occasion, parties, anniversaries, . . . 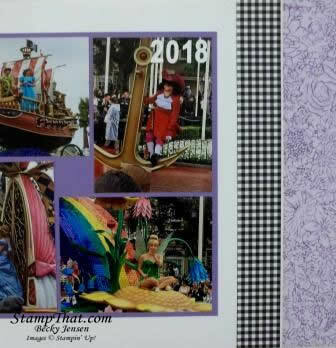 Thank you for sharing the “Parade Pictures with Butterflies” scrapbook pages. As usual I can see all the “TLC” you put into these pages. Love the bright and beautiful color.